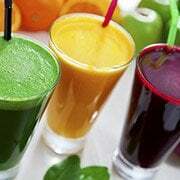 This delicious and nourishing juice recipe contains a variety of vitamins and minerals to promote optimal health. The fennel is full of potassium to keep your heart healthy. The pear offers your body antioxidant and anti-inflammatory support. The lemon aids in alkalinizing your system, helping to improve digestion.